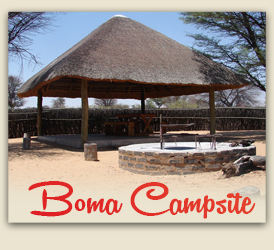 The Phirima Campsite is the boma (a camp encircled by a waist-high stick fence) where hunters can camp. This is a self-service camping area for those who prefer to sleep in their own tents. There is a lapa,braai (barbeque) area and running water in the boma. The communal bathroom is located close to the campsite and also has facilities for washing dishes and clothes. Close to that there is a “kuiergat” (amphitheater in the sand). Located on the dune closest the campsite, there is a braai (barbeque) spot where sundowners can be enjoyed while enjoying a panoramic view over the watering hole, watching game drink lazily.